A Quiet Place 2 is reportedly returning to Upstate New York to begin filming this summer. Buzz about the sequel has been high and John Krasinski is deeply satisfied with the story that he has come up with, though he is unsure at this time if he'll sign on to direct or not. Krasinski did not write the initial draft of the first movie, but he ended up doing some finetuning when all was said and done and turned the story into something original for the horror genre. 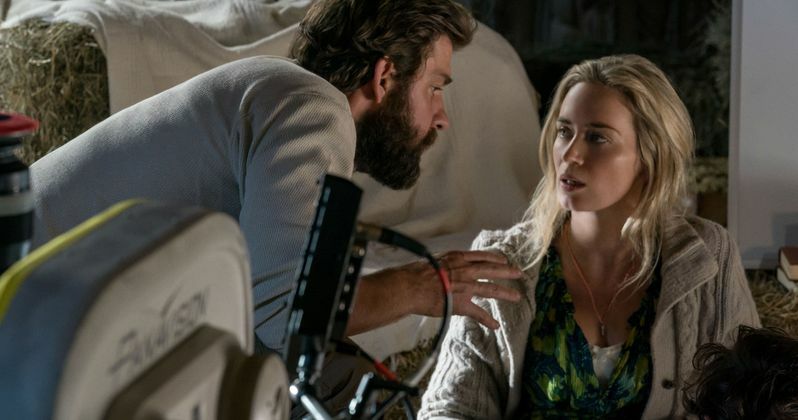 The studio was anxious to get moving on A Quiet Place 2 after the success of the original, and started contacting John Krasinski about the direction that they should take, since he wasn't attached to write at first. However, as the director/writer says, he was "Jedi mind tricked" into coming on board. With that being said, it looks like production is set to begin this summer, returning to Upstate New York, though it has not been revealed who will be at the helm when filming begins. This production time fits in well with the May 15th, 2020 release date. As far as the story details for A Quiet Place 2 are concerned, they are being kept under wraps. However, Emily Blunt has read the story and is excited to see the movie get made. It was Blunt that gave Krasinski the confidence to keep going, which has already put some pretty high expectations on the sequel. After A Quiet Place was such a big success, there's going to be a lot of pressure to make something that is even better than what they pulled off the first time, which is not going to be an easy task at all. While John Krasinski isn't sharing any of his story ideas for A Quiet Place 2, he has revealed a little about his approach. As he's said before, Krasinski feels that he's in a unique position to be crafting a sequel at this point in time and he sound pretty enthusiastic about it. He had this to say about the writing process for A Quiet Place 2. "Why I had this little idea that's now gotten bigger is most sequels are about a villain returning or a hero returning, and you have to build this entire world around just the idea that I have a hero or a villain. That's a lot, and I think that's where a lot of sequels go wrong because as much as you love that hero or villain, the entire thing is fabricated just to make that person work. (With A Quiet Place 2), we have the world. So it's actually the world that's built, it's the idea that the rest of the world is going through this exact same experience. Are there other people that have to survive like this? It's that idea of living through the set of circumstances, not again in the same way obviously, but exploring it more. You only got to do it intimately for a small amount of time, so what happens next?" John Krasinski is able to be just vague enough to keep fans frustrated and hooked to see what he's going to pull off with A Quiet Place 2. As for fans who are trying to figure out the story this early on, we should all just be happy that a sequel is officially happening, especially since it seemed doubtful that Krasinski was going to be involved at first. Since we're looking at a summer production start, more information should be available shortly. The production start was first reported by Production Weekly.